Renewable energy resources are virtually inexhaustible in duration but limited in the amount of energy that is available per unit of time. Renewable energy resources include biomass, hydropower, geothermal, solar, wind, ocean thermal, wave action, and tidal action. How Is Renewable Energy Used? Renewable energy is used for electricity generation, heat in industrial processes, heating and cooling buildings, and transportation fuels. Biomass energy is produced from non-fossilized materials derived from plants. Wood and wood waste are the largest sources of biomass energy followed by energy from municipal solid waste (MSW) and alcohol fuels. 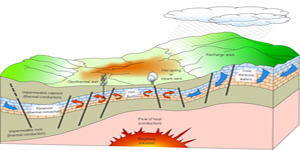 Geothermal energy is energy from the hot interior of the earth. Fissures in the earth’s crust allow water heated by geothermal energy to rise naturally to the surface at hot springs and geysers. Wells drilled into the earth allow heated steam or water to escape to the surface in a controlled manner to operate steam turbines and electricity generators. In a different type of application, the temperature of the earth or ground water relatively near the earth’s surface is used as a heat source and sink for “geothermal” heat pumps that heat and cool buildings. Wind energy comes from moving air which is converted to electrical power by a rotor and generator to create electricity or mechanical energy. This can be used for driving pumps and generators. 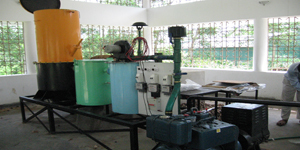 Water pumping windmills and small wind electric generators are the examples of this type of energy. Solar energy systems use solar radiation to produce heat and electricity. Solar Thermal-Electric Power Plants – Solar thermal-electric power plants use concentrating solar collectors to focus the sun’s rays to heat fluid to a high temperature. This working fluid can then be used to generate steam to operate a turbine, which is then used to produce electricity in a generator. Photovoltaic Systems – Photovoltaic (PV) systems are based on solar electric cells, which convert solar radiation directly into electricity. Individual PV cells are configured into modules of varying electricity producing capacities. PV applications range from single solar cells for powering watches to large installations with hundreds of modules for electric power production. Hydropower is electricity produced from flowing water. As a result, hydropower output varies widely according to rainfall. The newest “wave” in hydropower technologies is being developed to harness the energy in ocean tides, waves, and currents.